New freeways physically divided many neighborhoods in Columbus, and cut them off from surrounding communities and downtown. As people moved out of the old streetcar suburbs like Olde Towne East they experienced an economic decline. The United States experienced a period of extraordinary prosperity and economic growth after World War II. Contributing to this prosperity was public demand for goods and services. With so many families making a better living, the baby boom continued into the 1950s, reaching its peak in 1957 with 25 births per 1,000. Seeking more room, families left aging cities for the newer suburbs. The demand for housing and increased automobile ownership spurred the growth of suburbs. The growth of the automobile industry created a need for better and more roads. In the 1940s and 1950s, America’s highway system was a combination of local, state, and national efforts. The 1956 Federal-Aid Highway Act, also known as the Interstate Highway Act, provided $25 billion to build an interstate highway system of more than 40,000 miles. By the 1970s, the interstate highway system had transformed the United States. A 30-minute drive to work could now be now be made from 15 miles away. New suburban communities emerged at greater distance from the city centers. Two major interstates, I-71 (north-south) and I-70 (east-west) cross in Columbus. I-270, a 55- mile outerbelt was completed by the 1970s. The new freeways physically divided many neighborhoods in Columbus, and cut them off from surrounding communities and downtown. As people moved out of the old streetcar suburbs like Olde Towne East and into more distant suburbs, the heart of the city experienced a spiraling economic decline. Content Statement 19: Making decisions involves weighing costs and benefits. Content Statement 29: The postwar economic boom, greatly affected by advances in science, produced epic changes in American life. Content Statement 30: The continuing population flow from cities to suburbs, the internal migrations from the Rust Belt to the Sun Belt and the increase in immigration resulting from passage of the 1965 Immigration Act have had social and political effects. Explain the factors that contributed to post-World War II suburbanization in the United States. Discuss the effects that improvements in transportation technology had on the Olde Towne East area of the city. Analyze the impact of the Interstate Highway Act on American cities and neighborhoods. Describe how the Olde Towne East area has changed over time. 1. What factors contributed to the growth of suburbs in the post-World War II period? 2. What were the effects of the construction of the interstate system on the Olde Towne neighborhood? 3. What were some of the positive and negative consequences of the interstate system coming through the heart of Columbus? 4. How would your community react today if it was discovered a new interstate was being built through the heart of your neighborhood? How are these decisions made? Are these types of decisions still being made today? Teachers walk the students through a town forum. They are to role play citizens in a neighborhood or the freeway developers. The developers are working with a limited budget and other resources. The citizens live in a neighborhood steeped in culture and historic landmarks. Arguments should be made from each side’s perspective. Teachers can have students do research on the topics beforehand so as to create buy-in. This can wrap up a mini-study on pros and cons of the interstate highway system or a larger unit on roads and highways. 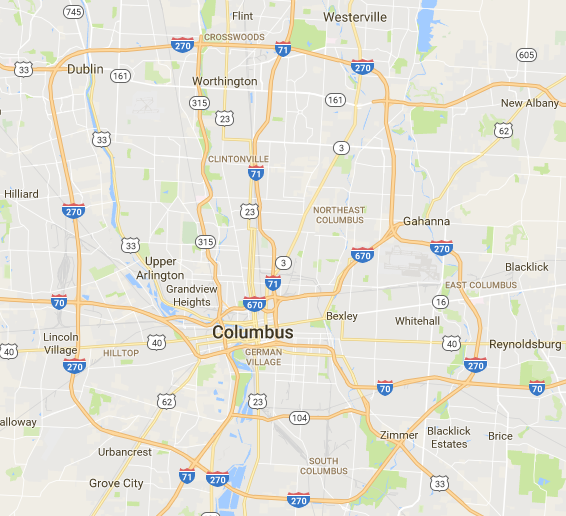 Do a map analysis of Columbus. Identify places on the map where streets and/or roads simply come to an abrupt end (Carpenter St., Gilbert St.). While showing the video, freeze the frame on the construction of the highway where the houses are right up along the drop into the freeway corridor. Facilitate discussion on how students would feel if they lived in that house or if their best friend lived a couple of blocks down and now are on the other side of the freeway, possibly going to another school. A collection of links to Olde Towne East places and topics. This is a website dedicated to information on how transportation shaped our lives, landscapes, culture, and communities. It contains lessons plans, games, and manymore resources. This is the New York City Municipal Archives photograph collection. The two photographs referenced demonstrate the contrast in life before the construction of highways and bridges with life after. This lesson plan has resources (including oral histories) on the impact on people and places caused by the interstate highway system, and also guides students through examining the pros and cons of an interstate highway system.